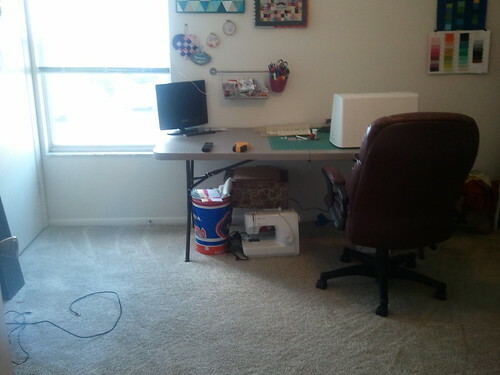 I cleaned up my sewing room over the weekend. I've never even seen some of that floor space since we moved in 8 months ago. Even Stephen's side of the room got cleaned up! 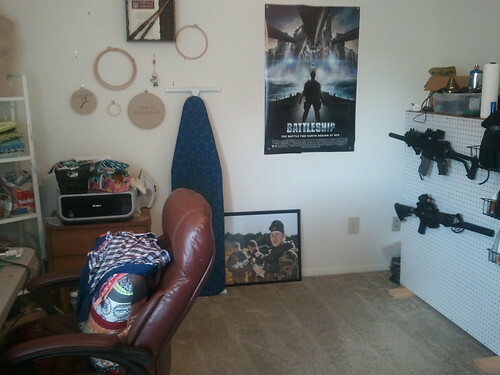 I cleared out a closet and we moved most of his big airsoft items in there. Airsoft is much like sewing in that it's a hobby where you end up amassing lots of stuff. Merging it all in one room means that it gets a little crazy sometimes. 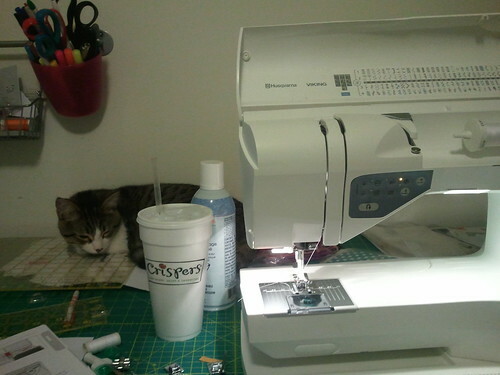 When I was cleaning up I packed away my mom's sewing machine and finally got to turn on my new Viking Sapphire! I took that puppy through her paces and...ZOMG. 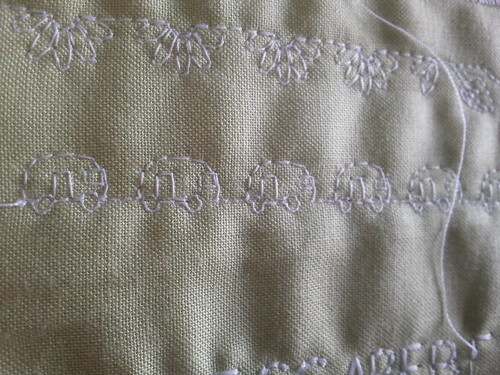 Sewing machine love. -I can sew so fast, thank goodness. I'm an impatient person. 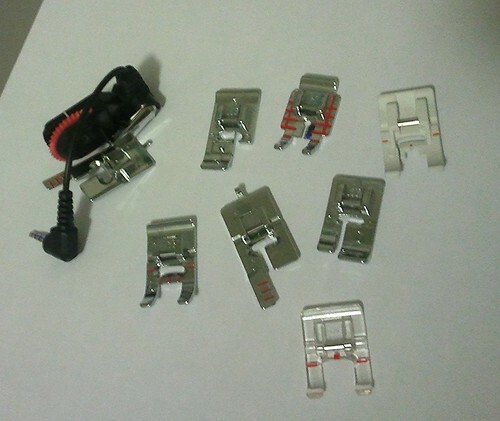 -The machine came with white thread already wound in the bobbin and set up and threaded so that you can sew immediately out of the box. Legit. 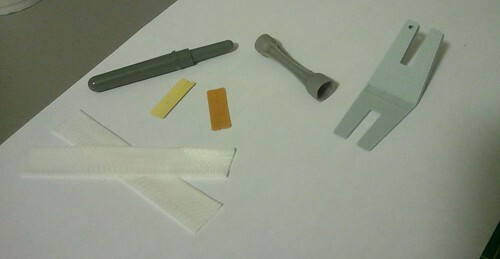 -What in the world are these supplies that came with my machine?! -Why that fancy-looking foot is a one-step sensor buttonhole foot instead of a regular presser foot that marks your next quilting line....imagine a hera marker attached to your presser foot...should I be taking this idea to the patent website?! -I couldn't figure out for a bit how to get to the free-motion settings, because the manual doesn't explain that part great at all. 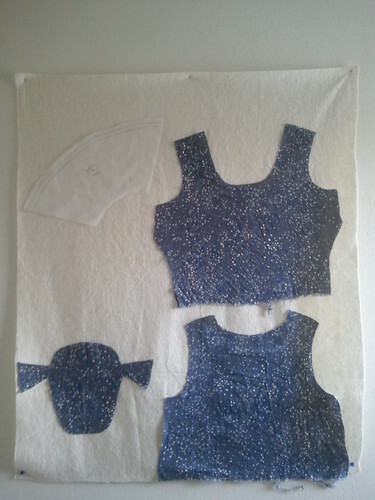 I wanted to just get in and sew before I started really playing around, so now I have a quilted pillow top! I've had some long days at work lately, but then moments like this come along that make it all worth it. Sweet new machine, I LOVE the camper stitch! I know most of your supplies but there are a couple I can't see that we'll, I'm on my iPod, so they're pretty small... Right side....hump jumper- for when you're sewing from a thick bit to a thinner bit (or vice versa) helps to bridge the gap so your stitches don't go wonky. Beside it is your lightbulb changer. Yup. That's the only way you'll be able to get it out! Don't lose it! Look carefully, one end says "out" one end says "in". 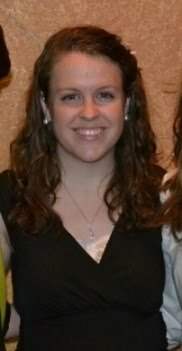 Those are the only ones I can see well enough. You will really love your machine, I've had my Husqvarna for years and think its the greatest thing ever! 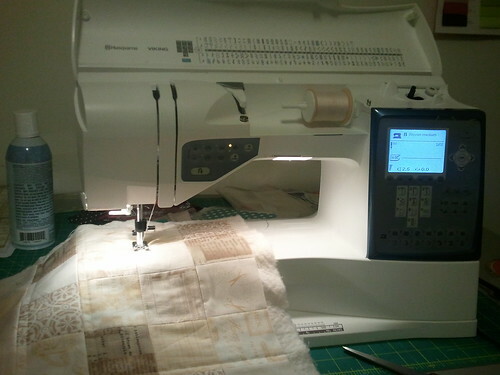 My machine.. a different machine, came with lots of feet, but I still had to buy a separate embroidery foot for FMQ. When I bought that foot it came with a sheet that explained how to use that foot. Drop the feed dogs etc for FMQ. 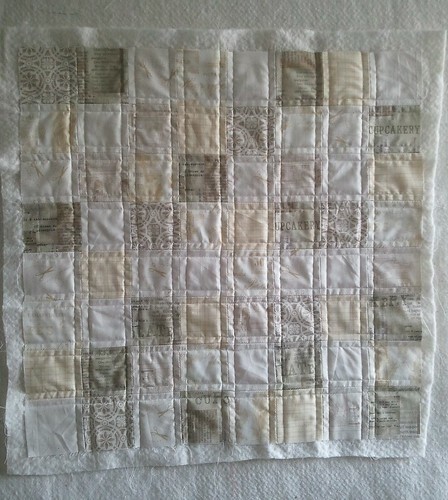 The strangest thing of all that I figured out just yesterday was that I didn't have to change my tension AT ALL to do FMQ.. WEIRD!! I had moved it all over the place.. and finally I moved it back to normal.. and got it right..I should have tried it there first LOL. Actually, I used to have a Sapphire...The "forky" thing on the right is for holding your buttons in place so you can stitch them onto your fabric with the machine. Yep, you can sew your buttons on. The net things go over spools that are speciality threads to keep acting properly with your machine. Whether or not you use most of those feet will depend on what sewing you do. If you ever make curtains or hem pants you'll use your blind hem foot. 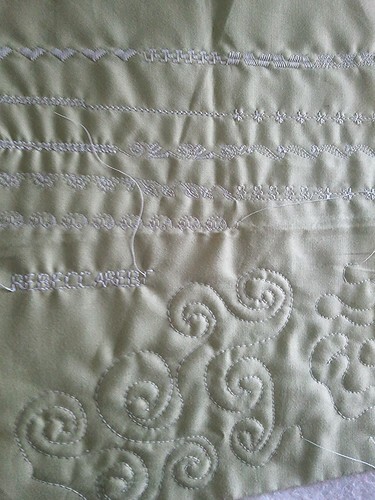 If you ever applique by machine you will use the clear open toe foot. Etc. That button hole foot is fantastic and is one of the few things I miss about my Viking. I think the little orange and yellow tapes are put at the bottom of your feet if you want to sew over leather/vinyl. The white foot is the teflon foot which is generally used to sew over leather/vinyl. The J foot is for overcasting/edging, which I have found helpful to zigzag over edges to prevent fraying since I don't have a serger. The one with all the lines is a quilting foot (no guide) but has quarter and eighth inch markers. The clear open toe I have used for applique work. It looks like you have two buttonhole feet - a small and a large. If you have a Joann's nearby that has a Viking store inside, I bet one of the sales people would be able to help you out. I got a Sapphire also!! I got the 850, used...love it now that I kind of figured out how to use it. 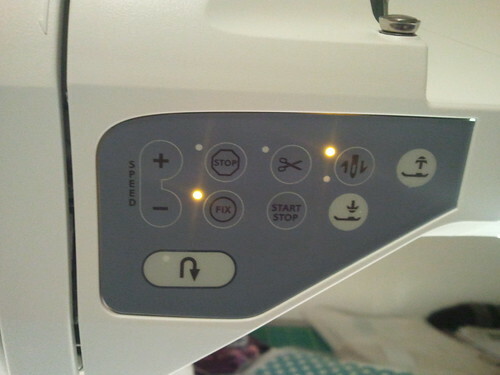 I found the manual pretty useless-I couldn't even thread the machine/load the bobbin without the use of YouTube, lol. The local dealer has an owner's class that I might have to break down and take, this machine is so different from my Brother. I've figured out the basics and a few fun little things (like just tapping the pedal and the presser foot raises slightly so you can pivot, niiiiiiice) but I know there's lots I just won't figure out unless someone tells me. The Humper Jumper is an amazing tool. Just think of the times your machine gets stuck on thick seams, Humper jumper to the rescue. Put it under the back of the foot and it sews perfectly! The nets go over threads that like to fall off the spool like metallics. I use the clear foot or the Teflon foot most od the time.